Andorra has lots to offer all year round, but most winter visitors come for the snow, and specifically to savour the delights of the largest ski area in the Pyrenees. In Grandvalira and Vallnord, Andorra boasts two of Europe’s leading winter sports destinations, while the family resorts of Naturlandia and Parador Canaro are perfect for children and novice skiers, but also offer a range of winter activities to suit every taste. With 210 kilometres of piste, Grandvalira in the north of the country is the largest ski area in the whole of the Pyrenees. This winter, the resort celebrates its 10th anniversary with the completion of the new Àliga run, 2.9 kilometres long and 50 to 60 metres wide, in the village of El Tarter. This will be Andorra’s first downhill course, and will put the principality in a position to host world-class racing events. The resort is also using artificial snow to increase its skiable area by five percent, and is continuing to develop nursery slopes and off-piste areas. And a night at the Iglú ice hotel is an experience never to be forgotten. Vallnord is the family resort par excellence, with 93 km of piste. It is also renowned for its off-piste skiing, and in 2014 it celebrates the 20th anniversary of the first area devoted exclusively to this activity, in Arcalís. The resort offers a host of adventure pursuits, including heli-skiing to explore the more remote areas. On a more sedate note, and in keeping with an increasingly widespread trend in the Alps, the Clear Days festival is a series of themed musical events held at the foot of the pistes every day between 1 and 5 p.m. Vallnord is also becoming increasingly high-tech, and offers wi-fi coverage across all three of its sectors (Arcalís, Arinsal and Pal) so that visitors can consult the piste map or check the weather forecast even when they’re on a chairlift. Naturlandia is a perfect destination for younger visitors, who can try their hands at cross-country skiing on the La Rabassa snowfield, experience a thrilling 5.3-kilometre ride on the Tobotronc, the world's longest “alpine coaster”, learn to build an igloo, or go snowshoeing. Parador Canaro, meanwhile, is a three-hectare ski area entirely dedicated to young learners. Sleep in an ice hotel, go para-skiing, or enjoy a bird’s-eye view of the slopes from a helicopter: just some of Andorra’s many unforgettable winter attractions. In addition to conventional skiing, Andorra offers many more unusual ways to get your snow fix. 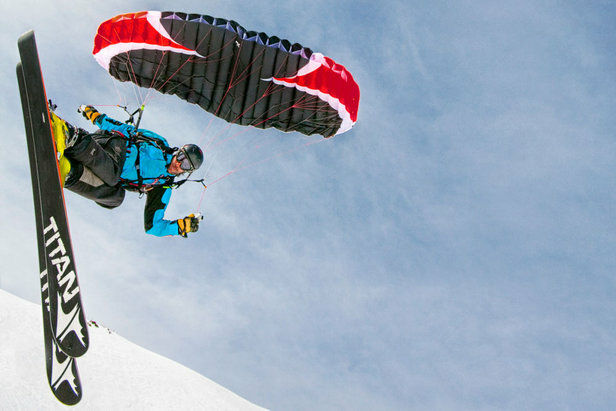 Vallnord is the only place in the Iberian peninsula with a school devoted to speed riding: in this action-packed blend of skiing and paragliding, the rider uses a parachute to glide just above the contours of the slope for a fast and thrilling mountain descent. Motorised activities for adrenaline addicts include snowmobile and buggy rides at Vallnord and Grandvalira, groomer rides at Grandvalira, and, at Arcalís-Vallnord, excursions on the Gicafer – a tracked vehicle with comfortable seating that can explore areas inaccessible to most vehicles. Gicafer trips run both during the day and after dark, and are perfect for children. And helicopter rides are available at both resorts, providing breathtaking views of Andorra’s magnificent mountain scenery. Man’s best friend plays a key role in two of the outdoor activities on offer: skijoring, in which you’re pulled along on skis by dogs, is available at Grandvalira, and you can go mushing with huskies at both resorts. Another heart-stopping way of going downhill very fast is airboarding, which uses inflatable sleds. Like most things, it’s best when you do it with a group of friends, and you can try it out in the Pal sector of Vallnord. But not all the fun is outdoors. A new addition to Andorra’s already extensive range of sporting attractions is 360° Extrem, one of the first indoor freestyle centres in southern Europe. With 2,800 square metres of floor space and a ceiling over 16 metres high, it has plenty of room for just about every kind of freestyling, be it on a bike, on skis or on a skateboard. There are even facilities for gymnastics and synchronised swimming. Perhaps the most unusual of all the area’s attractions is the Hotel Iglú, in the Grau Roig district of Grandvalira, which is made entirely of ice and simply melts away each year with the onset of spring. The suites are equipped with thermal sleeping bags and furs, and the hotel has a jacuzzi and restaurant. It’s a great place for a refreshing drink and a bite to eat after a hard day on the piste, and even better for a romantic night in a snowy mountain hideaway.